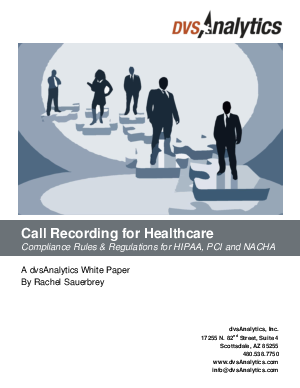 Healthcare businesses are rapidly expanding call recording throughout their organizations to improve patient satisfaction and document patient related communications for compliance. Because of increasingly strict federal, state, and industry regulations aimed at protecting sensitive data, an understanding of the required rules and standards and how they relate to call recording is critical. The purpose of this white paper is to summarize relevant regulations and assist the reader in determining technological solutions and processes to ensure compliance.